This protected park is in the Retezat mountains in Hunedoara county. Home to many endangered and vulnerable flora and fauna, it is Romania’s oldest park. It also has many peaks and crystal-clear glacier lakes. It looks like something straight out of the fairy tale making it every hiker’s dream. If you are a passionate hiker or a wilderness enthusiast, then you should visit this place at least ones in your lifetime. Discover more from this place on your own. Do not forget to check weather conditions before heading out. To personalise your visit to the city, you can use an all-inclusive Brasov trip planner for the same that will give detailed information about visiting the city. Hotels like Pension Casa Samurai, Pensiunea Leo, Residence Ambient and Casa Iacob will solve your problem of where to stay in Brasov. If you want to add the visit to Retezat National Park in your trip, you can choose from the variety of Brasov vacation packages that can be designed to suit your preferences. These packages also cover your major concern of how to reach Brasov. It's beautiful but romania has more to offer than this. Go there if you want to hike in one of most beautiful, peaceful and breathtaking mountains in Romania. Once you went there you'll definitely return. You'll get for your effort: mountain peaks, beautiful valleys, ice cold glacier lakes and spectacular views! Retezat National Park was an absolute gem and the perfect end of a month long cycle trip through Eastern Europe. A friend and I rented a Dacia Duster in Timisoara and entered the park through highway 685 which leads to Gura Apelor. As you can see from the photo, there were fallen rocks on the road in many spots. The photo was from one of the first piles of rocks we saw and was hardly the last. I would recommend taking a car with some ground clearance; however, it seemed that several locals were driving to Gura Apelor in sedans. Once across the dam we were not able to proceed further than Continual Silvic. If you look at Google Maps footage you will see that there is a wide open space in front of Cantonul Silvic. As long as you are okay with being woken to the sound of sheep bells, this open space is a perfect place to pitch a tent. We were told that the road past Cantonul Silvic was closed due to recent heavy rains so you may want to check on road status if you were hoping to proceed by car to Camping Poiana Pelegii. We were initially disappointed about not be able to continue further but camping on the shores of Gura Apelor was absolutely tranquil. The following day we hiked the Gura Apei trail to the rim of Lacul Zanoaga. 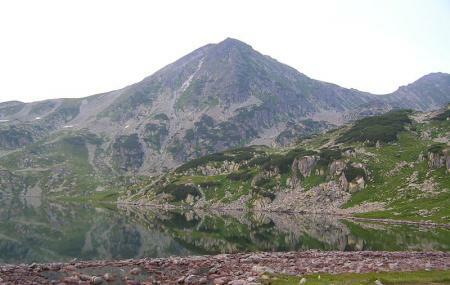 The trailhead can be found approximately a kilometer after Cantonul Silvic. We were rewarded with a memorable hike that ranks up there as one of my favorite hikes to date.